This past Friday night we had the kids joint birthday party at The Slide and Jump Zone. Each year they get to pick out a theme for the party. This year I just knew it would be Hello Kitty and Spider man but surprisingly they decided on Mickey and Minnie Mouse. I'm not crazy about Mickey and Minnie but I did like how they matched and how it was bright colors. Here is their cake. It was a cupcake pull apart cake which I HIGHLY recommend. There is no cutting involved! Ryan said it looks like a Christmas tree, it's suppose to be a party hat. Tanner and his best bud Austin. Yep, that's Tammy holding a baby. Shocking, I know! I didn't get a good picture of their shirts that Gill made but they were so cute. You can kind of see the back of Ryleigh's in this picture. Tanner's said Stokley with a 3 on it. The front had their initials. Me and Zoe. Tanner and her call each other their best friends! Ryan was playing on the jumps which is why he's so sweaty! I didn't get many pictures of them open presents but I wanted to get this one for sure. All they asked for over 100 times were DS's. This is Ryleigh realizing she got one. She hasn't put it down since! And this is Tanner realizing that h got one to! They had a great birthday party! Thank you so much everyone for coming and thank you so much for all the presents! We are so blessed to have such great family and friends and we are so thankful for all of you!! A little back story on Tans DS. Ryleigh is the one who really wanted one and he just wanted one because she did. I originally wasn't going to get him one just because we got him the 4 wheeler and Ds's aren't cheap! Well Nana had Lindsey's old DS (and when I say old. it looks brand new.) So anyway Nana wasn't using it so she said we could have it. (That's why when they unwrapped them his wasn't in a box.) Anyway ever since they found out Nana had a DS she instantly became the coolest Nana ever. Well on the way home Tanner says "Mama, my DS is just like Nana's!! Isn't that cool!" I died laughing and said Yep, Tan Man your DS is just like Nana's! I'm going to start the second story by saying "Ryan stresses me out!" During the present opening process at the party (which most of you know is stressful, all the presents + all the kids = craziness!) Ryan was standing up behind me while I was on the floor helping them. The next thing I know I see Little Ryan (even though he's bigger than my Ryan I'm going to refer to him as little Ryan so you'll know who I'm talking about) hit the floor. Like completely passed out and fell on the concrete and on top of all the kids presents. It scared me to death. I wasn't paying attention so I had no idea what had happened. I then see Ryan and Aunt Velvet trying to help him up. A few seconds later I found out Ryan had put Little Ryan in a choker hold and Little Ryan never "tapped out" (that's the word they kept using) so he then passed out! I was so mad at Ryan I couldn't believe he made him pass out. Evidently it's something they do and you are suppose to "tap out" before you pass out. Little Ryan was saying that he wouldn't pass out or tap out and that Evan always had to. I was worried Aunt Cheryl was going to be mad but she wasn't. Everyone who we've told this story to has said the same thing..."Did he tap out?" "No" "Well then it's his fault, you're suppose to tap out!" 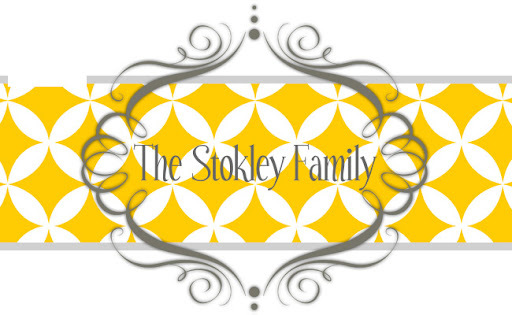 So there is your Public Service Announcement brought to you on behalf of The Stokley Family: If you ever get in a choker hold make sure you TAP OUT!!!! Cute pictures! Look like it was a lot of fun. One thing for sure - your family never is boring. I can not believe that Ryan passed out, but he really should have "tapped out" ! Lol!